One of the key features of the latest version of the USDA's classic dietary system, the food pyramid, is its personalisation. It’s been designed to allow each individual to tailor the pyramid to their own levels of health and activity so that they can move towards a more active, more healthy, lifestyle based on their own weight, health situation and current levels of physical exertion. One key feature of the new pyramid is that physical activity should be included as a daily health choice, along with food. It’s important not to think of healthy diets as being ‘all or nothing’ – instead it’s vital to accept that any sustainable diet contains treats and foods that used to be thought of as off limits, it simply limits the amounts and frequency with which they are eaten so that they become a rare and appreciated treat rather than a daily occurrence. This stops you feeling you’ve failed each time you eat a loved, but potentially unhealthy, food, and instead allows you to balance your diet so that your indulgence is buttressed by other, healthier, food choices over the course of a day, week or month. The new food pyramid allows a simple visual way of improving your diet choices – it’s easy to see that you should choose more foods from the wide bands of the pyramid and eat them more often, while you should choose fewer foods from the narrow bands and eat them less often. This means that you don’t have to become burdened with counting calories or weighing portions – just enjoy the foods you love from the wide bands on a regular basis and limit the foods you love from the narrow ones to treats rather than daily meals. Begin your dietary improvement by taking the foods you like best from the wide bands of the pyramid and complementing them with other foods from those bands that have a different colour and texture – so if you love whole-wheat bread, complement it with a creamy low fat cheese and a crispy chopped celery and walnut mix to create a tasty sandwich. By adding one healthy food to another in this way, you can gradually convert your diet to more healthy and enjoyable meals without being pressured to change your habits. The classic system of dieting has encouraged us to change our entire eating pattern overnight, but that leads to cheating or to feeling terrible when you ‘fall off’ your diet sheet. Instead, for permanent diet improvement, change one thing at a time and allow the new habit to become ingrained before moving on to the next one. 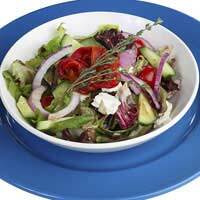 As an example, if you want to eat more vegetables, don’t go straight into eating salad every lunchtime. Instead, begin by adding salad as an ingredient to your daily sandwich. Then change one sandwich every week to salad in a wrap or tortilla instead of buttered bread. Then put the salad in a lunch box once a week, and top it with crunchy croutons. By making these small changes, you may find that you’re happy to have salad four or five days a week without feeling deprived of your favourite crusty bread. By eating with friends and family whenever possible we make food into a social benefit, not just a fuel. Slowing down when we eat, and appreciating every mouthful, allows us to really enjoy our food, and to recognise when we have eaten enough so that we don’t continue to mindlessly swallow food we no longer want. Enjoying the times at which we eat, as well as the foods we consume, can be one of our best tools when improving our diets.